Rhubarb sorbet, with some vulgar science. | ostrich milk. Rhubarb sorbet, with some vulgar science. Study: RHUBARB. 2.9 Rhubarb sorbet. This rhubarb sorbet is delicate and luxurious. This is GWAR, not guar. It also involves transforming a raw chicken egg into laboratory equipment. Sorbets can be hyper-sensitive. With too much sugar, sorbet will not freeze in the machine. Even if the sorbet seems perfect after churning, with too little sugar, it will quickly transform into a block of ice in the freezer. The most effective way to make a sorbet involves: 1. A degree from Penn State, which secretly controls the world’s ice cream supply, and 2. Liquid nitrogen. Here’s how to do a perfect sorbet with a fifty dollar Cuisinart machine. It uses a combination of three components: 1. A flavor base, 2. A syrup, 3. A stabilizer. By slowly integrating the syrup into the flavor base, it is possible to gain precise control over the sugar content. A stabilizer prevents the ice crystals from growing too large. Ingredient: 2 cups rhubarb juice, chilled. You could reduce the juice to concentrate the flavor, but its probably unnecessary giving the sharp flavor of rhubarb juice. Add peels for color. While stirring, slowly introduce syrup into very warm, but not boiling, juice. Be careful with temperature here. Because rhubarb juice will start as cloudy, it may be difficult to see sugar dissolve. As the syrup simmers, it will clarify. If a saturated sugar mixture becomes too warm, the sugar will begin to caramelize. Strain syrup to remove peels. Allow the syrup to cool to room temperature or just below. Ingredients: 1/3 tsp. guar gum. 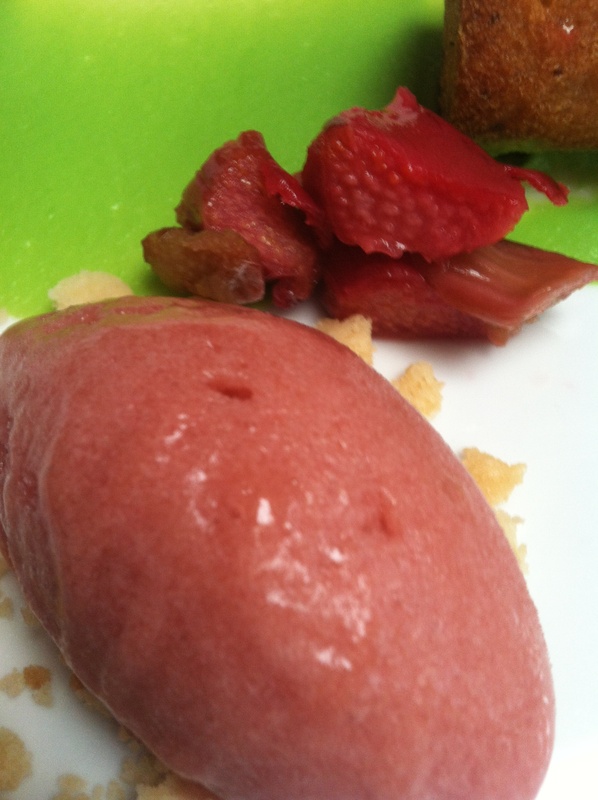 Strawberry-Rhubarb Sorbet at Black Dog. High-quality ice creams can sometimes get away without a stabilizer because the fat in the cream combines with sugar’s ability to lower the freezing point to limit how much ice crystals can grow. But sorbets don’t have fat: something more than just sugar is needed. Some sorbet recipes just add vodka, which lowers the freezing point. Gelatin and agar are also options. Pectin itself is sometimes used as a stabilizer. (Its often on the ingredients list of commercial organic sorbets). Fruits that naturally have high pectin do not really need a stabilizer, so adding a little strawberry to this mix could make it work, but drastically changes the chemistry. But rhubarb alone has very little pectin. Something else is needed. Xanthan gum is a little harder to come by, but is quite inexpensive when found. (Mine is from Chicago’s Spice House.) Sprinkle the guar and xanthan into a chilled mixture of the juices. Lemon is used here because an acidic mixture is needed to best activate the guar. Agitate the mixture with an immersion blender to incorporate.Too much guar will lend a bean-y flavor. Too much xanthan will create an impenetrable, mucosal, gellified mess. Unrelatedly, GWAR also creates a mucosal mess. Combine the flavor base and the syrup. This is a science-y part. As long as the temperature of the solution is known, the specific gravity of the solution can serve as a proxy for its sugar content, according to the equation underlying the Baumé scale. Let’s just use a raw chicken egg. Because an egg is incompressible, has a constant mass, and is only slightly more dense than water, it is a ready-made hydrometer. Wash the cold raw egg very well, scrubbing with anti-bacterial dish soap. Rinse the egg well. At room temperature pour most of the juice into a deep glass bowl and add the about half of the syrup mixture. Gently place the egg into the bowl, pointed end down. It should sink. Remove egg and add syrup in small amounts, replacing the egg each time. As the liquid becomes more dense by adding syrup, the egg becomes more buoyant, and will breach the surface after a few tries. When the diameter of the portion of the egg above the surface of the mixture is about the same as the diameter of a nickel, the sugar level is right. When working with frozen desserts, remember that flavor intensity is reduced by freezing. (Think about the difference between a harshly acidic taste of a room temperature cola with the must softer taste of a cola served cold). So, the sorbet base should be a bit too sweet, and a bit too strong. With a whisk or immersion blender, incorporate the stabilizer into the juice-syrup mixture. Some pieces of foam may remain, but they will be distributed by the churning. Allow mixture to chill. Adding a well-minced sprig of mint at this point can brings a nice, refreshing flavor. To best churn with a home ice cream maker, everything must be extremely cold. Chill the sorbet base to just above the freezing point. Freeze the bowl of the ice cream maker to well below freezing, using the lowest setting on on your freezer. For small ice cream makers, placing the entire ice cream maker in the freezer can help. Churn, following the manufacturer’s directions. Keep the mixture chilled overnight, if possible, to temper. Serve with a sprig of mint or sorrel. The rhubarb sorbet at Chicago’s Sprout. This entry was posted in Rhubarb, Studies and tagged dessert, frozen, gelee, guar, hydrocolloids, juniper, molecular gastronomy, recipes, Rhubarb, Sorbet, Studies, xanthan. Bookmark the permalink. Rhubarb, sticky, still pink, sponsored by the letter ‘R’. STUDY 3.0: BLUEBERRY (Pancake Breakfast, Deconstructed).